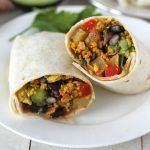 An easy recipe for tofu breakfast burritos that include roasted potatoes, a delicious tofu scramble, and fresh toppings. 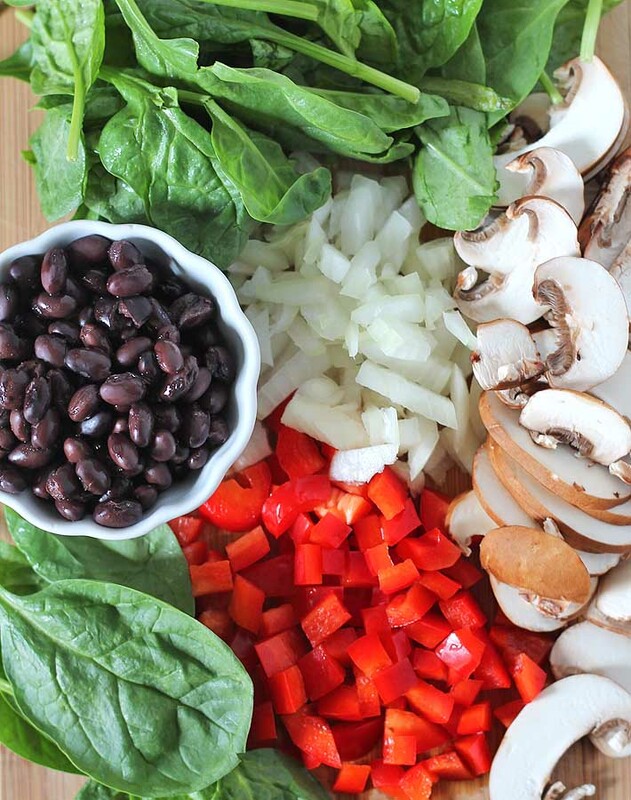 These burritos can be served right away or made in advance and put in the freezer for later! For a while now, my kids want absolutely nothing to do with cereal for breakfast. I wrote a little about this over on CBC Parents, but basically, cereal is off the menu and it’s all about ANYTHING BUT cereal. 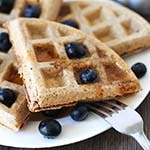 There are plenty of other breakfast options out there, but I wanted new things that were nutritious, easy to make, and things they’d actually eat. 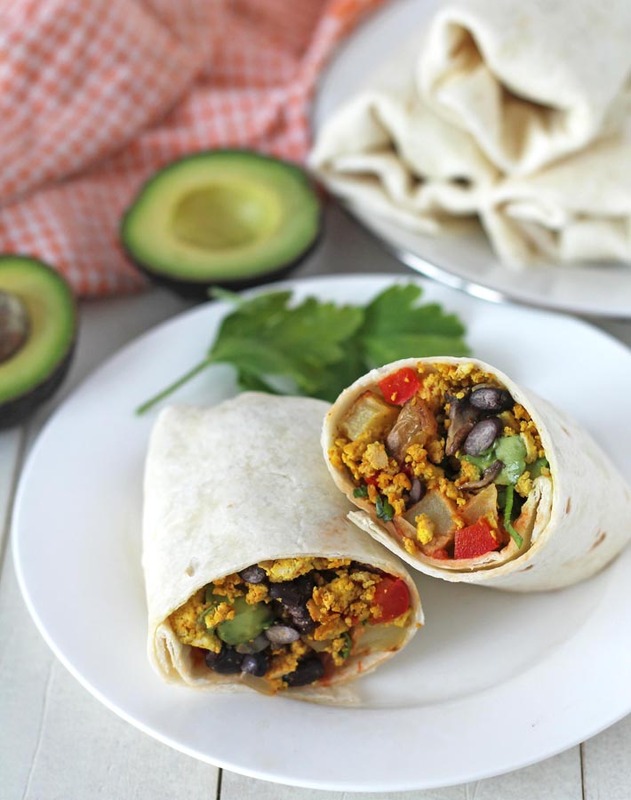 While brainstorming ideas for new breakfast options, these tofu breakfast burritos made the shortlist and have become a fast favourite and are enjoyed with no complaints. I make a batch on the weekend, freeze them, and then they re-heat their tofu burritos on school mornings, by themselves. And no one has to eat cereal. Win, win. 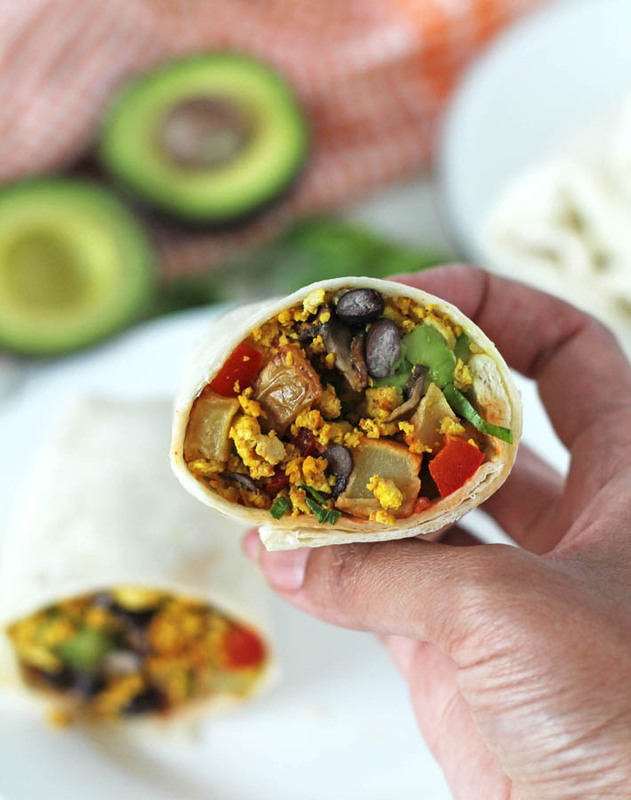 These vegetarian breakfast burritos are loaded with nutritious ingredients and the toppings can be anything you like. The roasted potatoes and the tofu scramble are the base fillings for your tofu breakfast burritos, but for the rest, you can customize based on what you like. For the burritos in the photos, I’ve added salsa, chopped parsley, and diced avocado. 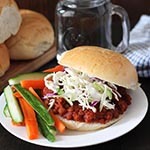 Every time you make them, you can use different toppings to see what your favourite combos are. As mentioned, these tofu burritos are 100% freezer-friendly. Make them on the weekend so you can enjoy a quick, filling breakfast on busy weekday mornings. Are there special steps to follow in order to freeze them? Yes. If you are going to make a big batch and freeze for later, I’ve included instructions in the recipe on how to do that. How about re-heating these tofu breakfast burritos? What is kala namak / black salt and why does this recipe call for it? Kala namak is also known as “Himalayan black salt” (even though it’s not black!) and contains sulpher compounds which will give your tofu scramble an “eggy” flavour. A little goes a long way when you add it to your recipes! If you’ve never had a tofu scramble before, the texture and look is very much like eggs (see images above!) and the kala namak will make the taste very similar to eggs. If eggs are something you enjoyed before, you will likely enjoy adding black salt to your vegetarian breakfast burritos. Kala namak is optional, so you if you don’t want to use it, regular salt can be used instead. To keep up to date on all of my recipes, please subscribe to my newsletter and if you make these, please share a pic with me on Instagram or let me know about it by leaving a comment below! 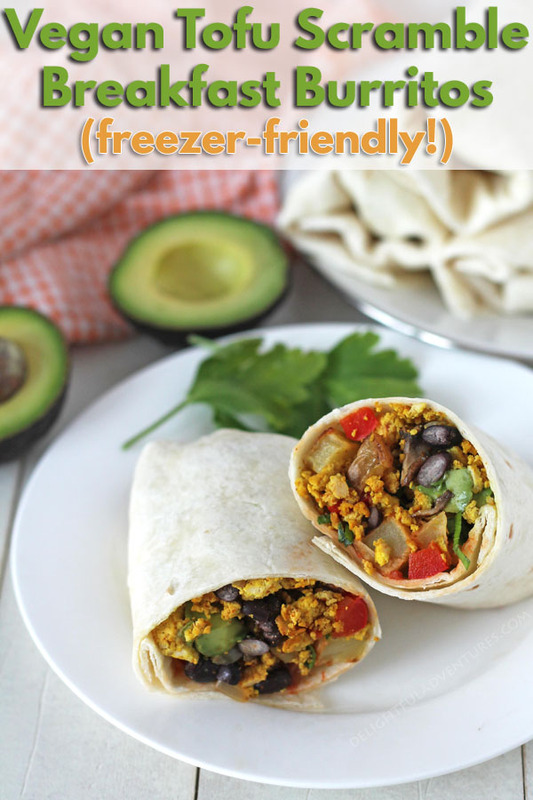 If you like these tofu breakfast burritos, you may also like these! 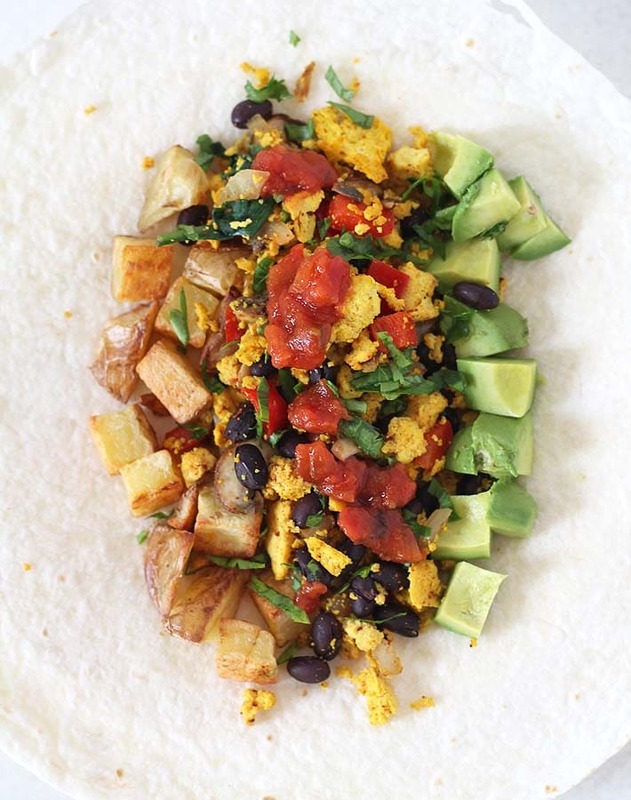 An easy recipe for freezer-friendly tofu breakfast burritos that include roasted potatoes, a delicious tofu scramble, and fresh toppings. Line a baking sheet with parchment paper (if needed). Place potatoes on the baking sheet and top with 1 teaspoon of oil and sprinkle with the salt. With a spoon or your hands, mix potatoes around so all pieces are coated with the oil and salt. Bake for 30 minutes or until brown and slightly crispy (see image above). Heat a large pan over medium heat. Once the pan is hot, add two teaspoons of the oil to the pan and let heat for a few seconds. Add onions to the pan and cook for 1 minute. Add red pepper and mushrooms and cook for another few minutes until everything is tender but not too soft. Add spinach and cook until spinach has wilted. Spoon vegetables into a bowl and set aside. Add the remaining teaspoon of oil to the same pan, add crumbled tofu and turmeric and stir until tofu is evenly coated with the turmeric. 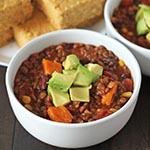 Add add optional chili powder and salt, mix until combined. Cook for another 5 minutes, or until the tofu starts to brown slightly. Add vegetables back to the pan and stir until everything has combined. Add black beans and mix again. Warm tortillas and assemble by dividing tofu scramble and potatoes among the six tortillas and top with garnishes of your choice. See info above for ideas. Wait until potatoes and tofu scramble have fully cooled before assembling. When cooled, divide tofu scramble and potatoes among the six tortillas. Do not add any toppings. Fold each burrito and then wrap individually in parchment squares. Place wrapped burritos in an airtight container or freezer bags. 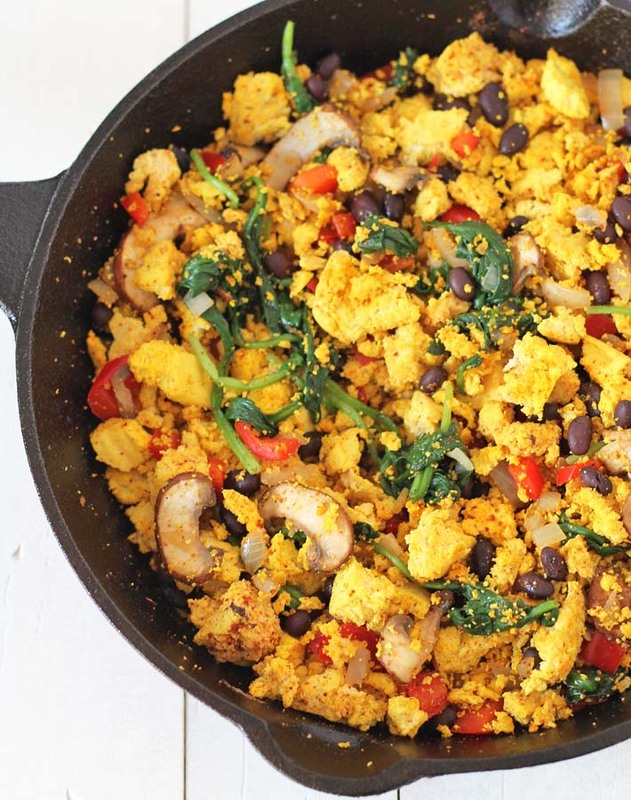 The tofu scramble is great as-is, but chili powder may be used to give it even more flavour. Other spices may also be used, based on your preferences. To reheat frozen burritos: Remove burrito from freezer (do not remove parchment paper) and place on a plate in the microwave. Heat for 2 minutes. Remove parchment paper, place back on plate and heat for another 1 1/2 minutes. Remove from microwave and garnish with toppings of choice (see info above for ideas).